Last week my Internet crew announced the first event in the lead-up to our 10th Annual PiratePalooza™ Pubcrawl & Pubsing, which has come to be regarded as the “Start of Pirate Season” in the southeastern United States. Last night they brought the submissions to my cabin and we reviewed the many wonderful submissions. I would particularly like to thank Hilda McBhiggböttum for her oil painting of “Captain Drew Astride a Mediterranean Concubine” but this has become a family show and so her amazing work (which should have won) will only be able to be seen by those who visit my cabin…. and lay in my hammock… and stare at the ceiling. As such I’m putting my 2nd choice (which I’m told has become quite terribly popular amongst the crews of many ships) forward as the winner of FIRST PRIZE for this competition… that’s it up top, in case you hadn’t already guessed. In a work of mad genius a Floridian pirate known to his friends as “John The Badger” has assembled a collage (a French word meaning ‘to glue’) from his own photo collection and from that of many others. For his bold act of photo piracy and his obvious grand artistic panache we will all stand back and clap heartily at this creation that celebrates 10 years of wonderful, wonderful boobies and Great Pirate Fun amongst some of the silliest, most smilingest ruffians you might ever hope to meet. GREAT WORK JOHN!!!!! THANK YOU FROM THE BOTTOM OF MY TREASURE CHEST!!! 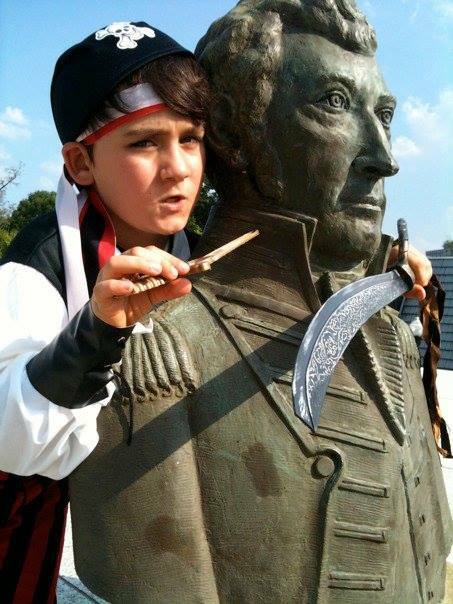 Our SECOND PRIZE goes to this photo of young Julian the Bloodthirsty, for having captured the bust of our Number One Enemy: Commodore Stephen Decatur. Such ferocity deserves an upgrade to the latest in space pirate weaponry: the Gloopgirdle Juggernaut XJ-7 Pocket Eliminator (requires batteries). Use it well, you little sea urchin. 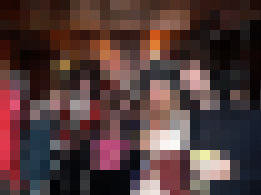 And our THIRD AND FINAL PRIZE goes to a Miss D’Toaster who has submitted a photo of herself at her very first PiratePalooza™ in 2009, from inside our dear departed pub known as The Angel. The remarkable thing about Miss D’Toaster’s entry is that it only has about 4 pixels in it. While I know that there were many submissions that were far more worthy, I was struck by the simplicity of this woman who has the temerity to submit a photograph that was obviously taken using a potato. This intrigues me, and I find that I must award her the final Space Pirate gun on the principle that it might in fact result in some sort of mayhem. Anyone willing to submit a 4-pixel photograph to a 10th Anniversary event must surely be deranged, and I’m all about enabling the deranged with state-of-the-art alien technology. It’s a calling. Thanks again to all who participated and to Mister Roger Wade Riddle for supplying the AMAZING space pirate guns! We’ll be ringing this Palooza in right and I hope that you’ll join us in the other events we celebrate on the way to our big date in Decatarrrr!! Listen up you scurvy lot, there be only 64 Days, 14 hours, and some odd minutes before the 10th Annual PiratePalooza™ begins… so as a warm-up to our upcoming 2nd annual scavenger hunt let’s give away some awesomely authentic plastic space pirate guns to the best THREE (3) PHOTOS that best captures the spirit of the One True, Beloved & Ancient PiratePalooza™. Just post your photo to our Facebook page or our Google+ page or tweet us a photo …. get the picture to us and we’ll add you to the contest. The contest ends at Midnight on Sunday, July 20th and the winners will be announced the following Friday!! 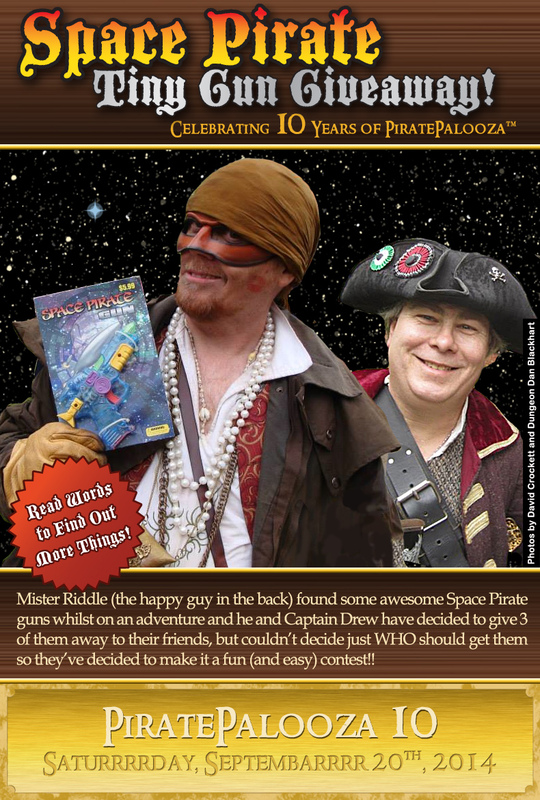 Be sure to share this with your friends, these plastic space pirate guns won’t be around forever – don’t miss out!! !